Tried loading the trial version to print directly onto a canon pixma ip7250 but a printer dialogue opens asking what size paper to use! 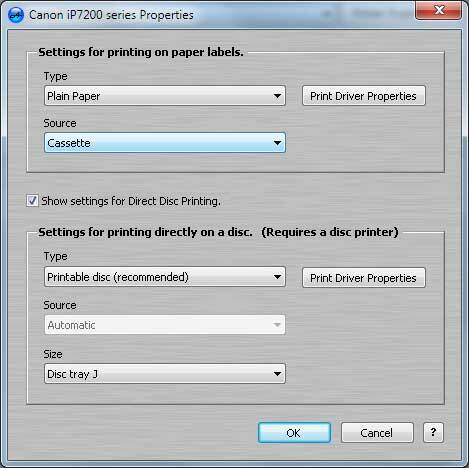 There is no option to print directly onto the disc even tho it states that a pixma 7200 has been defaulted. Does that mean that it is still not possible to print directly onto the disc and that paper has to be used? "you have chosen to print directly on the cd"
and when printing there is a direction to remove the disc tray and it then prints onto paper!! So looks like the downloaded trial software will not print directly onto disc even though it recognises that we want to print directly onto disc. 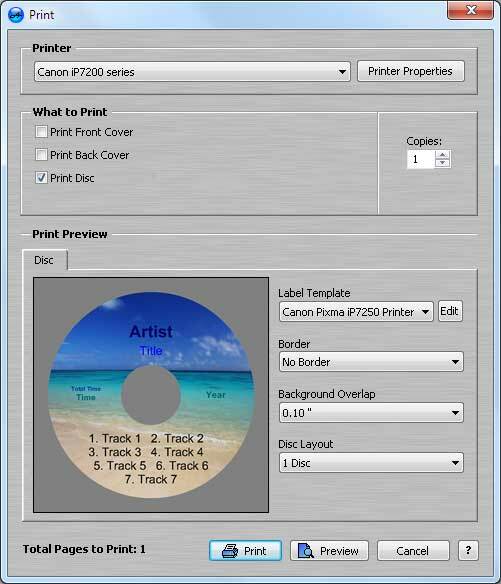 AudioLabel can print directly on discs using the Canon Pixma iP7250. If the printer prints to paper instead of the disc, then the print driver settings may need to be set correctly. Once you print, a dialog will pop up saying "You have chosen to print directly on a CD. Please make sure the print driver settings are correct on the next screen". The next screen will show the above "Print Driver Properties" dialog again to verify your settings are correct. 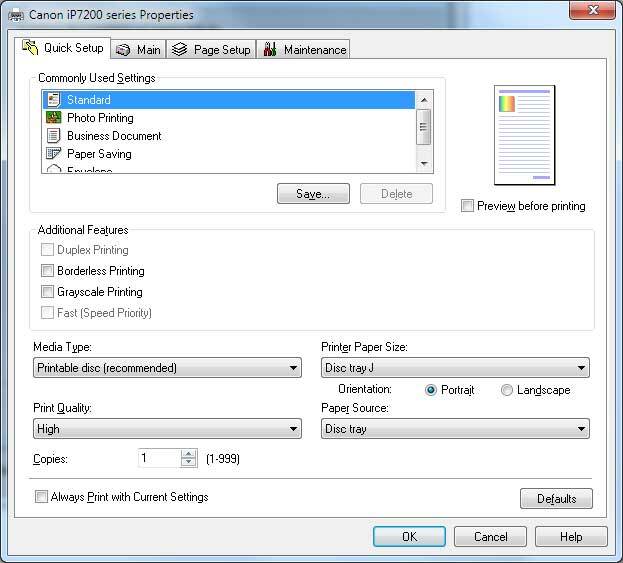 Do you have the same settings when printing directly on the disc using the Canon Pixma ip7250? Thank you so much and we have successfully printed to disc directly. Unfortunately the problem was not just getting the settings right but the printer requires the disc tray to be closed before printing rather than starting with it open. For multiple printing of discs is that going to be necessary for each disc? Ie closing and opening the disc tray and then inserting discs? The process for loading a disc into the printer is a little different for each brand and model of printer. The Canon iP7250 printer manual should have the exact process for loading discs. Unless you have a multiple disc tray loader, the process will most likely be one disc at a time. Please post to the forum if find any more information on the subject.